Deb's Cup of Tea: I Have a What? 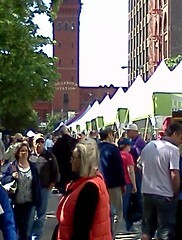 It was the Printer's Row Lit Fest this past weekend. It could not have been better weather for it. I went on Saturday. It was clear and sunny for the whole day with temperatures in the mid-70's. I have been down there, walking amongst the throngs, when it's been 90 so the fact that it was in the 70's seemed, to me, to be a talisman for excitement and discovery. The camera went missing the evening before. Of course, I found it in the pocket of my messenger bag on Sunday, so I had to take photos with my cell phone. It doesn't look clear but trust me, there was beautiful blue sky with nary a cloud in sight. I like to get there early because a loathe the crowds that don't allow you to look. A book fair like this, in reality, isn't a place for someone like me. I go with a list of books I am on the prowl to buy. That list, this year, included Erik Larson's most recent which is, now, 2 years old with a paperback version out; any Discworld books I haven't read and given that there are upwards of 25 in the series and I'm really not half-way through them, I should find more than a few I haven't read; and anything by Flannery O'Connor. My best friend, Patt, (not to be confused with my best friend, Pam) sent me a brilliant article discussing some of O'Connor's work. I know 'of' her, but I never took "Contemporary American Literature" while in college so never read anything she wrote. After reading this article, I need to get something and add it to the stack. Last year, I got a Godzilla poster which, sadly, remains unhung. I just haven't found the right spot for it. So, visiting places with posters is a waste of time. I have no wall space without removing something I currently have on the wall. I have a lot of things unframed that I want displayed, so I passed those booths by. With a list of authors I wanted, I was unmoved by the hardcovers at $5 or the paperbacks at $1. And the sheer crush of people means taking the time I want to browse mean inconveniencing people behind me who also want to see what's offered. So, I wound up doing a quick scan of titles and moving on. I also wish, but I'm sure it's quite impossible, that sellers would organize their offerings better. It would save time for me. I think they feel that if everything is jumbled together, it forces you to linger, to look and will, thereby cause you to find something you didn't know you needed. I always, always head first to one tent, Lake Claremont Press. This small press is regional publishing at its finest. If you are interested in Chicago and its history, their extensive list of books are sure to have something you will like. 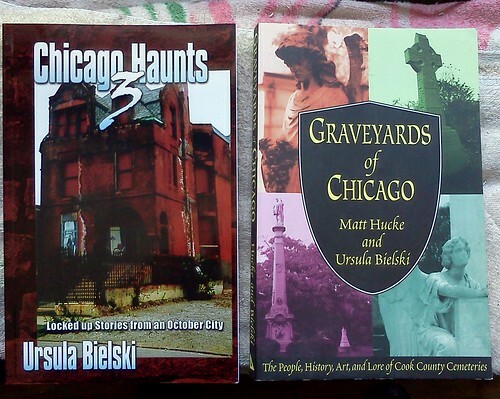 My interest in this publisher stems from finding, years ago, a book called "Chicago Haunts" by Ursula Bielski. I get announcements from them and I'm always excited to see what they have on offer, so my first stop at the book fair has always been their tent...except...when I can't find them. That was the case last year. I walked all over the fair looking for their name on the tent and it was nowhere to be found. What I discovered, the next day by checking out their Facebook page, was that they had been sandwiched into a tent with three other regional presses. I must have walked by them three or four times and never saw the name on the proper side of the tent. This year was different. Viola. 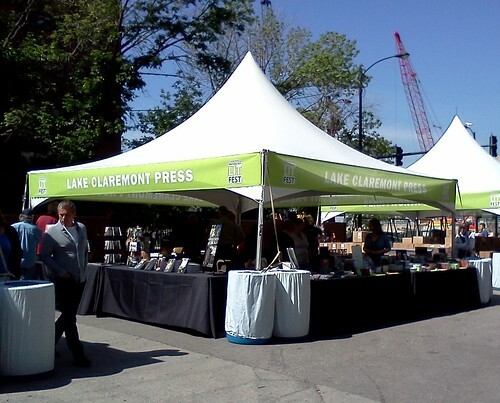 There is the Lake Claremont Press tent. Four sides of literary goodness. I walked all around looking at the books. I did get "Wrigley Field's Last World Series", a book about the last time the Cubs were in the World Series, 1945. My dad often talked about this event. It will be an interesting read. But what I really wanted was to check on the upcoming book, "Graveyards of Chicago". I have a copy of this. I've had it for years. It's in the stack to be read. In fact, I found it, pulled it out of the stack and brought it along to show them. I enjoy Ursula's books. I'm pretty sure there are two or three on the shelf in the basement. As I was standing there, chatting with a gal, a woman came up and I was told to talk to her. So, I showed her the book and asked about the upcoming one. She looked at my book and said, "Oh my gosh. This is a first edition. Do you realize this sells on eBay for $100 because it's out of print?" I was floored. (A subsequent search reveals that my pristine copy, which I hadn't gotten around to reading, was worth $150, although it could go higher if I did a bidding war on it.) I have never owned a first edition of any book. I've seen them. I've drooled over the idea of having a first edition, but usually those books are, as this lady said, $100 and up, and I can't really justify spending that kind of money on a book. To possess such a thing, on accident, left me speechless. When I mentioned that I was embarrassed to admit I hadn't even read it yet, the lady said, "Oh don't bother. The new one is coming out soon. I'm really proud of it. We put a lot of work into updating it with more accurate information." That's when it dawned on me. (I can be, admittedly, slow on the uptake sometimes.) I was talking with Ursula herself. I hope my subsequent comments were not too effusive. I don't run in the circles where the meeting of authors would be commonplace. To actually meet the author of books I have admired and enjoyed was a thrill. I wound up buying "Chicago Haunts 3". It's the next book to be read this summer. 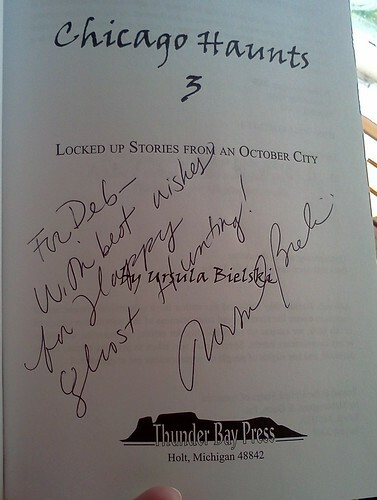 What was also a huge thrill for me was to have Ursula autograph my books. Here's the "Chicago Haunts 3" autograph. And yes, I had her autograph, personally, the first edition. That does diminish its value, but I am NOT selling it. This falls into the "prized possession" category now. I have a personalized, autographed first edition AND I met the author. I didn't find anything else at the fair and, actually, I didn't really care. This was an amazing set of occurrences. This 15 minutes made my whole day. In the grand scheme of finding things to be grateful for, I can live off this event for weeks. That might seem like hyperbole, but it's things like this that make me really happy. Now I have to make time to find the other titles I own by Ursula and arrange all of these on a shelf where they are visible.